“When will I be able to play again?” Following ACL reconstruction surgery, that’s a question physical therapists and orthopaedic surgeons invariably hear—often repeatedly—from their athletically inclined patients. The multiple factors that go into answering this difficult question are the subject of this complimentary webinar. Current evidence suggests that approximately 50 to 60 percent of patients post ACL-reconstruction eventually return to sports at preinjury levels. But the timing of that return—and the many variables leading to it—create a series of challenging clinical decision points. This webinars explores the most relevant surgical, rehabilitative, and patient-centered factors that contribute to sound decisions in which surgeons, physical therapists, and patients participate fully. Moderated by Robert Marx, MD, JBJS Associate Editor for Evidence-based Orthopaedics, this webinar focuses on two articles, one from each journal. After the articles’ primary authors present their data, two additional return-to-sports experts add their perspectives to this body of research. What’s New in Shoulder and Elbow Surgery? Using regional anesthesia rather than general anesthesia may reduce the risk of cerebral injury in surgical patients placed in the beach chair position. Patients with less-than-massive rotator cuff injuries who received a ketorolac injection into the subacromial space experienced greater improvements in pain, function, range, and strength than those receiving a corticosteroid injection. There was no significant difference in outcomes between platelet-rich plasma (PRP) injections and placebo injections in patients with either rotator-cuff tendinopathy or a tear involving less than 50% thickness. Barbotage was more effective than isolated subacromial injections in people with calcific tendinitis. In 83 patients followed for a mean of 10 months, 93% of double-row rotator-cuff repairs healed, compared with 75% of single-row repairs. PRP matrix insertion provided little or no clinical/functional improvement in rotator-cuff healing after arthroscopic repair. There was no apparent difference in rotator-cuff tear healing between those who were immobilized following arthroscopic repair and those exposed to early passive motion. After 26 weeks, there were no significant differences between two groups of patients with glenohumeral arthritis who received either thrice-weekly hyaluronic acid or placebo injections. A study comparing pegged versus keeled glenoid components in total shoulder arthroplasty revealed a risk ratio for revision that slightly favored pegged components. The complication rate was 37.5% among young (< 65 years old) reverse total shoulder arthroplasty patients five to fifteen years following surgery. At 24-weeks of follow up, patients with lateral epicondylitis (tennis elbow) who received a PRP injection had pain-score improvement of 5%, compared to 56.1% in the control group. No significant difference was observed at 12 weeks post injection. Another PRP study of 60 patients who were given a saline, PRP, or glucocorticoid injection for tennis elbow showed no significant difference in pain outcomes after three months, but the glucocorticoid group had a greater pain relief at the one-month follow up. Among 130 elbows treated for fractures or fracture-dislocation, 37% demonstrated heterotopic bone; among those 37%, 54% demonstrated decreased range of motion due to impingement of heterotopic bone. Risk factors for heterotopic bone included elbow subluxation or dislocation, severe chest injury, open fractures, and surgical-treatment delay. The latest market report from Transparency Market Research predicts that the global orthobiologics market will grow at a compound annual rate of nearly 6% over the next 5 years. In 2012, the orthobiologics market was worth $3.7 billion, and it is expected to hit $5.5 billion by the end of 2019. What will drive the growth? The 50+ population is expected to almost double by 2020, and increases in obesity and sports injuries will spur market growth. Technical improvements and a trend away from the use of autografts and allografts will also drive interest in orthobiologics. Kantar Media’s recent Mobile Device Usage Study evaluated 17 mobile apps. 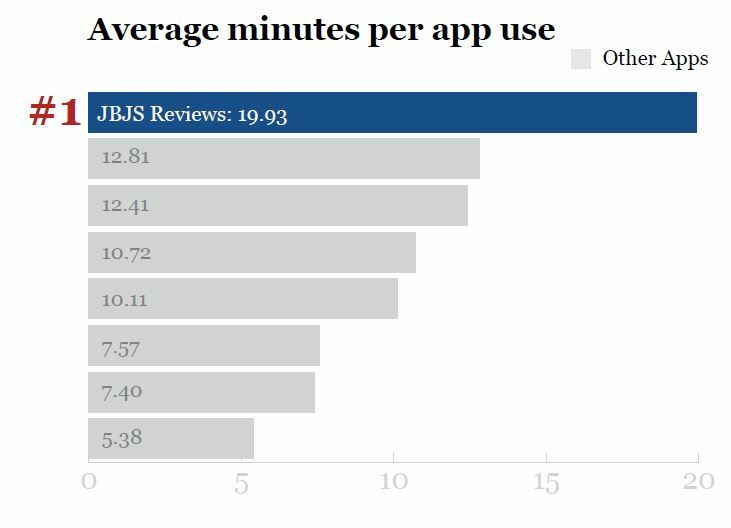 The study asked, orthopaedists which apps they used in the prior six months, time spent per usage, and how the apps they used performed on seven key performance metrics. JBJS Reviews (reviews.jbjs.org), an online review journal launched just one year ago, ranked first among orthopaedic app users in time spent as well as in the overall rating for the seven key performance indicators. JBJS Reviews ranked #1 on delivering quality clinical content, keeping surgeons informed on the latest practices and procedures, and as being one of the top professional resources. The survey also measured how physicians use tablets and smartphones. According to the study, physicians use smartphones primarily for managing contact information, texting colleagues, taking static images, maintaining their calendar and appointments, and emailing colleagues. The number-one for which doctors said they use tablets was viewing video, followed by receiving medical news. The study also looked at the types of apps used on the two types of devices. The apps most frequently used on smartphones are for drug references. Tablet users use both medical journal apps and apps to access EHRs. The JBJS Reviews App is available for iPhone, iPad, and Android devices. In a Sept. 17, 2014 JBJS article, David Ayers, MD and Patricia Franklin, MD outline lessons to be learned from the evolving U.S. and international total joint replacement registries. In a thought-provoking comment on that article, Shyan Lii Goh, an orthopaedic surgeon practicing in Australia, pinpoints some of the challenges American registries face. “An opportunity within grasp, but not taken, is still lost,” Dr. Goh observes. JBJS Editor’s Choice–Distal Radius Fractures in Older Men: Why So Much Publicity? In my 20-plus years serving as a deputy editor and editor of JBJS, I have never seen the kind of media interest in research published in The Journal that the Harper et al. study on distal radius fractures in older men has received. This well-done retrospective evaluation of 95 males and 344 females who were treated for a distal radius fracture at a single institution has been discussed in multiple forums and media outlets, including the national newswire services, scientific and clinical blog sites, and health reports on local and national TV newscasts. One conclusion from the Harper et al. analysis was that males older than 50 who had a distal radius fracture are receiving far worse follow-up care compared to females with the same characteristics in terms of bone-mineral density testing and subsequent pharmacologic treatment to prevent future fractures. For example, an older male with a fragility-caused distal radius fracture is nearly 10 times less likely to undergo bone-density testing than a woman with the same fracture. What is so newsworthy about this finding as to prompt headlines such as “Gender Bias in Osteoporosis Screening”? Orthopaedic surgeons are increasingly working in teams consisting of family physicians with additional musculoskeletal training, radiologists, anesthesiologists, nurses, PTs, OTs, and athletic trainers. As our field expands its scope to “musculoskeletal health, prevention, and treatment” and away from exclusively invasive interventions, let’s continue to invite the public along. Based on the media coverage of the Harper et al. study, the public appears to be a willing partner in our attempts to reduce the risk of fragility fractures. Do you think including preventive and population-health perspectives is the right direction for our field? Send us a comment of support or a dissenting view by clicking on the “Leave a Comment” button in the box to the left. Ea ch month during the coming year, OrthoBuzz will bring you a current commentary on a “classic” article from The Journal of Bone & Joint Surgery. These articles have been selected by the Editor-in-Chief and Deputy Editors of The Journal because of their long-standing significance to the orthopaedic community and the many citations they receive in the literature. Our OrthoBuzz commentators will highlight the impact that these JBJS articles have had on the practice of orthopaedics. Please feel free to join the conversation about these classics by clicking on the “Leave a Comment” button in the box to the left. “The Bankart Procedure” authored by Rowe et al (J Bone Joint Surg Am 1978; 60:1–16), is a true classic paper in the orthopaedic literature. This was the first large clinical series with good follow-up to report the findings and results of the open Bankart repair. The results were almost uniformly excellent and good, with low recurrence rates, and few complications. Although the study suffers from the usual flaws of a retrospective clinical study, it set a standard and contributed to the demise of non-anatomic repairs. More recent innovations in arthroscopy led to the development of arthroscopic Bankart labral repairs that are now the standard of care for most surgeons treating anterior glenohumeral instability. Although greater experience with arthroscopy appears to improve outcomes, failed instability repairs are not uncommon, and this has led to expanding efforts with alternative procedures such as the Latarjet coracoid transfer and remplissage. Interestingly, the contemporary focus on severe anterior glenoid bone loss and large Hill-Sachs lesions differs from the historical perspective that “The Bankart Procedure” presented in 1978. Is this the result of changes in patient pathology or expectations, or is it driven by surgeon perceptions of outcomes and the desire to innovate? I think it is a bit of both. Among the many points that Rowe et al. make in their landmark paper is the importance of meticulous technique. Orthopaedists often gloss over such statements in the literature, but I think most would agree that anterior instability repairs, open and arthroscopic, can be technically challenging, especially for the inexperienced surgeon. Referring to the Bankart procedure, Anthony DePalma clearly stated that “the operation is difficult and should only be performed by surgeons who are familiar with the topographic anatomy” (DePalma AF. Surgery of the Shoulder. JB Lippincott Co., Philadelphia, 1950, p. 236). Rowe et al. correctly identified the important pathologic causes of recurrent glenohumeral instability. The most recent basic and clinical research into the more complex aspects of anterior glenohumeral instability is likely to help better define the appropriate indications for alternative procedures to address these issues. JBJS is pleased to be partnering with INSIGHTS Orthopedics, featuring our online content within the new version of their app for iPad. INSIGHTS Orthopedics allows you to create your own personalized medical magazine from conveniently aggregated content, as well as follow what your peers, orthopaedic leaders, and leading Journal Clubs are reading. The newly launched Version 2.0 offers quicker access to relevant content through Featured Articles and reading recommendations. Will the New Congress Repeal SGR? Whether their political persuasions lie left, right, or center, almost all physicians agree that something permanent needs to be done about the sustainable growth rate (SGR) formula used for physician reimbursement under Medicare. Unless some legislative action is taken between now and March 31, 2015, a 21 percent cut in physician Medicare reimbursements will take effect on April 1. So, is the newly constituted Congress ready and willing to act? Not surprisingly, the answer to that question depends on whom you talk to, according to a recent MedPage Today article. Douglas Holtz-Eakin, PhD, former director of the Congressional Budget Office and current president of the American Action Forum, says “all eyes should be pointed toward 2015” for action on SGR, because the current lame-duck session is unlikely to take much action on health care. However, after the lame ducks hobble home, Holtz-Eakin predicts movement in Congress toward answering the $180 billion question: how to pay for an SGR repeal. If Congress approves another one-year “patch” of the current SGR-based system in early 2015 instead of a repeal, it will be the 18th time over 12 years that legislators have passed such temporary stopgaps. In recent years, both the AMA and the AAOS have staunchly opposed short-term “doc fixes” in favor of a once-and-for-all scrapping of the SGR. What do you think—will Congress repeal the SGR during 2015? Brown University scientists have found a more efficient way to identify potential bone-producing cells from human fat tissue, according to a new study in Stem Cell Research & Therapy. The researchers developed a fluorescent tag that latches onto cells that express a gene called ALPL, which is an indicator of increased osteogenic potential. A machine then detects the fluorescing light and separates the ALPL cells. According to the study, this new method produces more than twice the yield of bone-making cells (9 percent) compared to previous methods of sorting based on cell-surface proteins. Researchers found that the ALPL-positive cells also showed increases in metabolite production for chondrogenesis. Hetal Marble, lead author of the study, said in a Brown University press release that targeting gene expression rather than surface proteins in the search for cells capable of making new tissue is a “paradigm shift” that “allow[s] us to isolate cells that are capable of doing what we want.” To read the full press release, click here: https://news.brown.edu/articles/2014/10/sorting. To read the Stem Cell Research & Therapy study, click here: http://stemcellres.com/content/pdf/scrt502.pdf.